Artists Bo and Alison Jia observed the clash of traditional Chinese craftsmanship and Western industrial design, and let the two things bloom together into something beautiful. Here they have applied the refined art of Chinese porcelain to casts made from discarded cleaning product bottles. The porcelain has a coarse, unfinished texture and rich color. Stripped of their graphics, the stylish, almost Art Deco contours of the bottles will provide a striking focal point for any room, whether standing alone or paired with the natural complexity of a flower. Handmade in China. This item has been discontinued. When it sells out, it will no longer be available. We apologize for any inconvenience. Care Instructions: Clean carefully with a damp cloth. Perfect gift for that person who has everything and a sense of humor to boot! 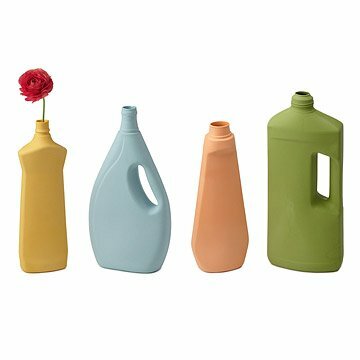 Ancient Chinese porcelain techniques are applied to casts made from discarded cleaning product bottles to create these stylish, industrial vases.